Starbucks Coffee Japan announced today the company will host its annual 9/9 campaign at Starbucks stores across the market this Sunday. In its fourth year, the campaign invites partners (employees) and customers alike to celebrate the company’s achievement in sourcing 99 percent of its coffee ethically, ensuring fair wages for farmers, environmentally friendly farming techniques and the highest quality beans. 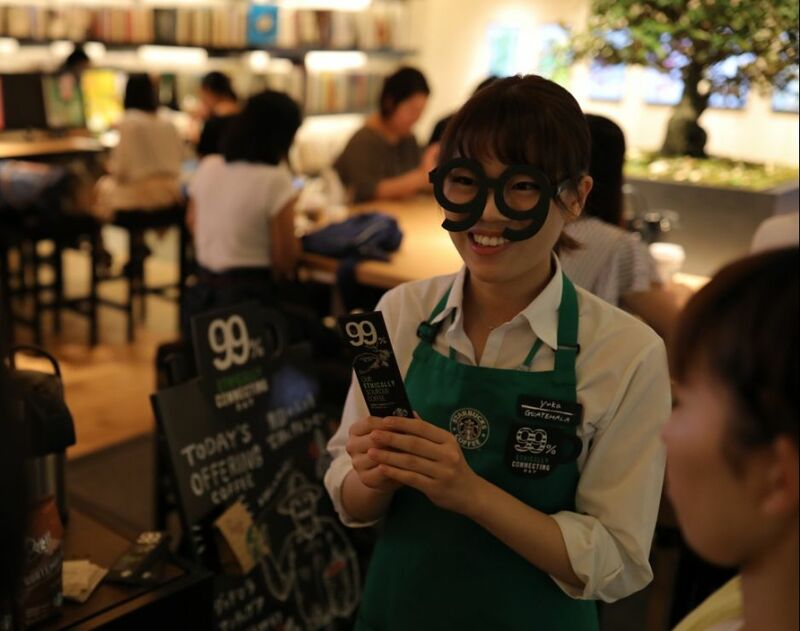 Beginning in 2015, Starbucks celebrates 9/9 by writing “99” on customers’ cups and hosting mini-seminars to educate customers on Starbucks ethical sourcing practices and impact on coffee farming communities. On September 9 – 9/9 – the stores invite customers to deepen their coffee knowledge and feel proud of their sustainable coffee purchases. This year, Starbucks is strengthening the human connection by partnering with Conservation International Japan, a nonprofit committed to environmental protection, to donate coffee seedlings to farmers in Guatemala affected by the Fuego Volcano eruption in June. From September 7th to the 9th, Starbucks will donate 1 percent of all drip coffee sales and 10 percent of sales of whole bean Guatemala Antigua and Autumn Blend in stores. Additionally, customers who have accumulated 150 Gold Stars through My Starbucks Rewards and received a Reward eTicket, can choose to donate 500 yen with each eTicket instead of redeeming for a beverage, food item or package of whole bean coffee between Sept. 7 through Sept.20. Customers will also have the opportunity to attend an extended coffee seminar with Starbucks Asia Pacific Coffee Ambassador, Major Cohen, who has been involved in the 9/9 celebrations since the beginning. Cohen will host a one-and-a-half-hour session on Sunday at the Ark Hills store to describe his personal journey with coffee, Starbucks recently opened Hacienda Alsacia Visitor Center at Starbucks farm in Costa Rica and the company’s relational approach to its coffee supply chain. Starbucks Coffee and Farmer Equity Practices (C.A.F.E.) Practices lay out the guidelines for growing, processing, quality and sourcing coffee to make it the world’s first sustainable agricultural product. Developed in 2004 in collaboration with Conservation International as a set of social, economic, environmental and quality guidelines to prescribe how coffee should be ethically sourced. Starbucks uses these guidelines to evaluate its coffee supply chains, consisting of hundreds or thousands of farmers, to determine which supply chains produce the highest quality coffee in the most socially and environmentally responsible ways. Supply chain performance is evaluated through a network of third-party verifiers, which have confirmed 99 percent ethically sourced coffee since April 2015. Through Starbucks Farmer Support Centers in nine locations around the world, farmers have access to open-source agronomy practices to sustainably increase their productivity. From bean to cup, Starbucks is ensuring the long-term supply of high-quality coffees, as well as building stronger, enduring farming communities for generations to come.